Virtual workplaces are no longer the province of young technophiles, and we must become more conscious of the particular challenges and issues those considered “nontraditional” face in this new environment. Continued globalization, fostered in part by computer-mediated communication, is bringing diverse populations together in virtual spaces; however, because we bring our culture with us when we move online, the default identity of the faceless virtual workplace becomes the young, white male. How do those considered nontraditional then negotiate their identity in order to contribute successfully? 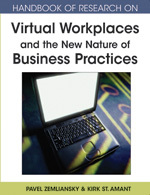 This chapter will explore this question with a case study of a Vietnam veteran in the workplace of a freshman writing classroom and, in doing so, will invite educators, employers, and researchers into discussions of virtual identity and interaction, how we perform ourselves in online workplaces, and fostering virtual communities. Globalization: This term typically means to extend to other or all parts of the globe or make worldwide. In the context of this chapter, the term is used to argue that diverse populations of people are brought together as computer-mediated communication extends into other parts of the globe. Computer-Mediated Communication: A broad term used to describe any means by which a computer serves as a medium of communication between two or more people. Common examples include listservs, chatrooms, and blogs. Technophile: A term used to describe someone who has love or enthusiasm for technology, especially computer technology. The term often has a negative connotation, often used to describe someone who is blinded by their enthusiasm for computer technology and uncritical of its uses. Decentered Classroom: Considered a common characteristic of online learning, this term describes a classroom in which power and authority is not centered solely with the instructor but is dispersed or entrusted to students. Nontraditional student: A term used to label a student that is not attending college right out of high school. Synonymous with adult student and re-entry student, the term is typically used to describe a much older student attending college for the first time or returning after an extended period of time.